i want to create some New categories, which do you want ? - new simulations? which one? and which Topic? Downloads? so please give me a Feedback. the costs, i want to update the Forum, to a higher Level- more space, more traffic, less advertise! - anyone which want to create a new one? Thank you for being back. I thought i lost you all and im involved in some Developments here. All i know from you Guys goes over this Platform. The Banner is Great. Its a Style-Icon in our World i think, even if Visitors could think this Site isnt ready yet. Its Still "under construction". About new categories: What is about a NoGrip-Tribute Category. We can give it another Name and also the Packs from Gamers Crip are welcome. All the Stuff from NoGrip and Gamers Crib is lost in the Web. But im sure nearly all Files are Hidden on our HDs. We can share them on this way. BTW: Can you reorganize the Messageboxes. I mean, can you reduce the Outbox Size by maybe 80% and share it to the other Message-Boxes. My Boxes are over 90% Full and it will hurt me, if i have to Kill some old Messages. I dont know if it is possible, but i think none of us has ever used more then 10 or 15% of the outbox. A repository of some sort for them would be great so they can be shared again by the community. Wonderful to see you back, sheesh I had only recently found you and suddenly you disappeared! Yeah the nogrip idea is a great one, I have been searching everywhere for two cars to complete my World Sportscar Championship cars (1967-1971), the Ferrari 512S and the Matra 650, so I can run series. I also think a section on modding techniques would be excellent. Coming from an IT background, I would appreciate some instruction. I'm new to being active in the GTL/GTR2 sim racing community, but I've been a lurker on these forums for about a year. I have most of the mods from NoGrip for GT Legends and GTR2 on my hard drive, and if I have permission and won't get in trouble I'd gladly post them in a NoGrip tribute forum. There we go the files are available thank you CodyS1998 It could all work. I also think a section on modding techniques would be excellent. Yes! Good Idea! I like to share my Knowledge with others and i have also a lot of leaks of Wisdom. Physics are a Great Mystery for me. You can see it in my 700RS Mod. A very wayward behavior i think. A Modding for Beginners Thread and Ask and Answer Threads divided in Graphics/Physics/Sound/Misc were helpful. AMAZING thanks Muddie7272, I had pretty much given up hope, and now 70/71 are complete in addition to 67-69. These were halcyon days for Sports Car racing; I used to get taken to Kyalami, which is just 13 km away from me, by two photographers in the late 60's, early 70's, and one year after the nine hour race, we went to the after-party with the Alfa Romeo team, which was held in a garage somewhere in suburbia, with the cars standing there. It was like heaven for a 16/17 year old. I have many great memories from that era, one of the greatest in motor sport history, with real cars that did very little compensation and adjustment for the driver, one had to work hard. In the eighties I raced bikes (yeah insane) and I know the old track well; it's the track I use to test new mods. I am also willing to make some of the mods I downloaded before nogrip fell over available on my Google Drive account. I have a question/query about the GT40/Mirage, maybe should put in the modding section, because the existing GT40 mod does not enable one to develop Mirage performance; the car was a lot quicker that the AI or I can drive it, even if I put in the 427 motor, reduce the weight, and adjust the aerodynamic drag quotient. I understand real cars very well, having owned 23 cars and built several, and been a racing gamer for forever, so I know exactly how a set of variables SHOULD interact, but cannot get the GT40 to go like a Mirage; it seems almost insulting to put the JW skin on a car that is struggling to beat the 906's. 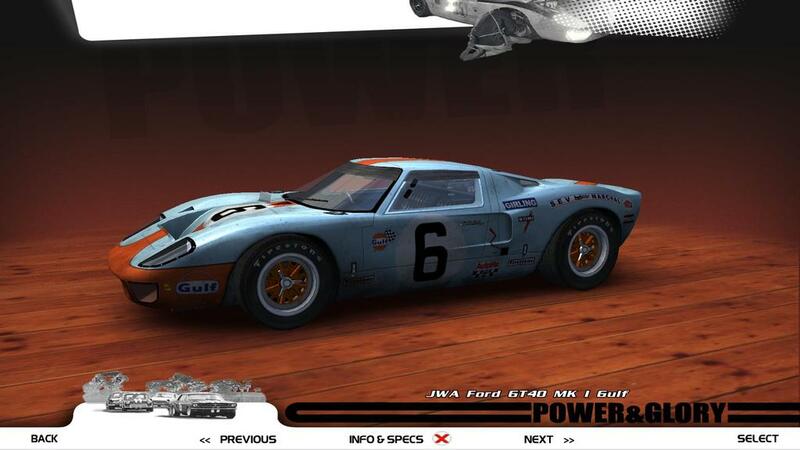 Uncomman, there is a JWA Gulf GT40/Mirage #1075 in the Power & Glory mod in the PTC Over 2 Liter folder. Maybe try the physics on that one. It might come closer to the one you have been using. For 1968 the FIA placed a ceiling on engine displacement, which made Ford's works team lose interest. Some privateer teams like JWA would return with the GT40 Mk I. Backed by Gulf Oil, and led by John Wyer, who bought up the assets of FAV in the UK, the changes in the car would include a lightweight roof, 5-liter (302ci) v8 engine with Gurney Weslake heads and Weber carbs, ZF-5speed transaxle, and JWAE/BRM 10-inch and 12-inch wheels. Although the Gulf spec cars had a smaller engine, they were often capable to copy the lap times the 7 litre GT40s (Mark II and IV) had posted before. #1075 has an incredible race history attached to it. Although not officially recorded as such, it was in fact a rebuild of one of the 1967 JWA Mirages, available information showing it to be M.10003. It raced as a Gulf/JWA team car in every contended round of the 1968 World Sports Car Championship with the outstanding results of outright wins at the BOAC 500, Spa, Watkins Glen, Le Mans and third overall (A class win) at Nurburgring. In 1969 it won at Sebring, Florida and again triumphed at Le Mans driven by Ickx/Oliver. This meant that GT40 P/1075 was the first car to win Le Mans twice. It was also the one of the closest finishes with Ickx crossing the line 100 yards in front of the second place Porsche 908. Hey fisheracing yeah I know about #1075 , it's the reason why I want to set up the GT40 as a Mirage before I start the 1968/69 seasons, and with the current setup the car will not do justice to its heritage. Unfortunately I don't have GTR2 or Power and Glory, although this is something I intend correcting as soon as I have some time. I will certainly check out your suggestion once I have, may be a solution. nogrip Tribute only GTL and GTR2? only Download section? And beautiful they are, my deep appreciation for the work you do. Someday, I'd like to do just one mod that is comparable. ...which is why we need a techniques teaching section! THANK YOU, THANK YOU, THANK YOU! All my Wishes are fulfilled. Thats not only a Phrase. Its pure truth. Even the Message Boxes. Space for Eternity. Ahhh! Your Mods. You are a Man from the first hour. As i remember right are these Mod under the oldest Uploads on NoGrip. Must be a hard Job making Mods at this Time. Do you think there will be Trouble Anyway. Usually the Name of the Createor is included in the Name. So the Credits comes with the Download. Love all the new categories!!!! I disappear for 6 months and the internet explodes? Just tried to log into Nogrip - and they are disappeared ?? What happened? Then I came here and here too was gone. Lucky I keep my emails because I only got a notification from Evo just 2 days ago - used the link in that to find the new (old) Evo. NoGrip disappeared without prior notice around end of May - big loss mainly for database and forum. No notification at all? Wow. If successful, I will upload it to mediafire in batches. The mods.